For other uses, see Mouna Raagam. Mouna Ragam (English: Silent Symphony), also spelt Mouna Raagam, is a 1986 Indian Tamil-language romantic drama film written and directed by Mani Ratnam, and produced by G. Venkateswaran. The film narrates the life of Divya (Revathi), who is robbed of her carefree existence when she reluctantly marries Chandrakumar (Mohan). Divya, mourning the shooting death of her former lover Manohar (Karthik), did not really want to be married. The story follows Divya's inner conflict between holding onto her past and coming to terms with the present and making a life with Chandrakumar. The film's development began when Ratnam began writing a short story, "Divya", while the production of his first film, Pallavi Anu Pallavi (1983) was delayed. He did not intend to film it, but after writing the story, realised that it had cinematic possibilities. "Divya" later developed into a film script with the same name, and was eventually renamed Mouna Ragam. Although Ratnam completed work on the script during Pallavi Anu Pallavi, it did not begin production until after the release of his fourth film, Idaya Kovil (1985). Mouna Ragam was the first film produced by Venkateswaran's Sujatha Films (later renamed GV Films), and was filmed primarily in Chennai, with additional filming in Delhi and Agra. The soundtrack album and background score were composed by Ilaiyaraaja, with lyrics by Vaali. P. C. Sreeram was the film's cinematographer, and its art director was Thota Tharani. It was edited by B. Lenin and V. T. Vijayan. Mouna Ragam was released on 15 August 1986, India's Independence Day. Despite a modest beginning, it became a box-office success, with a theatrical run of over 175 days, and a major breakthrough in Ratnam's career. The film received critical acclaim; it won the National Film Award for Best Feature Film in Tamil, and Ratnam received the Filmfare Award for Best Tamil Director. The soundtrack by Ilaiyaraaja has been regarded by critics as one of his greatest works. Mouna Ragam also became a landmark film in Karthik's career despite his role being a cameo. It was later dubbed in Telugu with the same title. The film was remade in Hindi in 1992 as Kasak, and in Kannada in 1999 as Chandrodaya. Divya is a free-spirited college student from a conservative family whose strict father, Chandramouli, works for the government. She learns that her parents are eagerly awaiting a marriage proposal for her. Unwilling to get married, and hoping that the groom's family will reject her, she deliberately arrives home late and completely drenched in rain, only to find Chandrakumar (the groom) and his family patiently waiting for her. She talks arrogantly to Chandrakumar to make him dislike her but, undeterred, he says that he likes her and agrees to the marriage. Divya initially refuses, but when her father has a heart attack her family begs her to accept the proposal to aid his recovery. Succumbing to the pressure, Divya marries Chandrakumar. After their marriage Chandrakumar takes Divya to Delhi, but she cannot accept him as her husband and ignores him. When he asks her what she would like as a wedding gift, she says she wants a divorce. Startled, Chandrakumar asks her why; in a flashback, Divya remembers when she was in love with Manohar, whom she met as a college student. Manohar and his gang assault and rob the son of Thamizhmani, an MP. Divya reports Manohar to the police, and he is arrested. She later learns that Thamizhmani's son had run over a girl with his car, and Manohar stole the money to pay for the girl's medical treatment. Divya feels guilty, and bails him out. Manohar falls in love with Divya, and tries to win her love; although she initially rejects him, eventually she returns his feelings. Manohar is a member of a revolutionary group who plan to hold an illegal rally. Divya does not approve, and asks him not to attend; he agrees if she will marry him. On their wedding day, Manohar is falsely accused of participating in the rally and arrested. He escapes, and runs to the marriage registrar's office where Divya is waiting for him. A policeman accidentally shoots Manohar, and he dies in front of Divya. Although Chandrakumar is ready to forget Divya's past, she cannot accept another man in her life. They consult a lawyer who tells them that according to the law, since they are newly married they must wait one year to file for divorce. The couple are forced to live together for a year. Having told Chandrakumar about her past and the reason why she was unable to accept her marriage, Divya finds herself finally free from her mental baggage and depressed state. She begins to appreciate her situation and make the most of it. Conversely, Chandrakumar is wary of her as he fears what would happen at the end of the year when their divorce would be approved. Troubled, he distances himself from her and rejects her every move. At the same time he slowly begins falling in love with her while denying his feelings to himself. Chandrakumar is attacked by his company's labourers because he had suspended their union leader. Divya brings him to a nearby hospital, where he survives after receiving treatment. After he is discharged from the hospital, Divya takes care of him and realises that she has fallen in love with him. She tries to show it by wearing the anklets Chandrakumar gave her shortly after their marriage but before she could do this, Chandrakumar asks her to return to her parents home and books her trip, thinking she was simply being immature (as she was trying to surprise him by the sound of her feet). At the railway station, Chandrakumar gives Divya the divorce papers that she had requested as a wedding gift. Divya breaks down, telling Chandrakumar that she loves him and would wait indefinitely for him to reciprocate, and tears the divorce papers. A pleasantly surprised Chandrakumar catches up with the train which Divya is in, stops it and takes Divya home, having reconciled with her. When the last schedule for Mani Ratnam's first film Pallavi Anu Pallavi (1983) was delayed inordinately, he began work on a story entitled "Divya"—which eventually became Mouna Ragam, his fifth film. Ratnam said he began "Divya" as a short story about a couple's wedding night. He did not originally plan to film it, but after writing the story he realised that it had cinematic possibilities. Ratnam took a one-month break from Pallavi Anu Pallavi, and wrote the script for Divya. The new title Mouna Ragam was derived from the song "Naan Paadum Mouna Ragam", from Ratnam's fourth film, Idaya Kovil (1985). Ratnam said that due to budgetary constraints, it would have been easier to send the female lead to Bangalore instead of Delhi, but he did not want her to be able to easily return to her parents because she could not adjust to her husband. Mouna Ragam was Ratnam's first collaboration with cinematographer P. C. Sreeram. He initially narrated the script of Mouna Ragam (when it was titled Divya) to Malayalam film producer N. G. John, but the latter wanted a political film, which eventually became the Malayalam-language film Unaru (1984), also directed by Ratnam. He then pitched Divya to G. Thyagarajan of Sathya Jyothi Films, but Thyagarajan wanted an action film, and Ratnam made Pagal Nilavu (1985) with him. Kovaithambi of Motherland Pictures too rejected Divya, saying it was not the kind of film Motherland would produce, and Ratnam instead made Idaya Kovil with them. The film was eventually picked up by Ratnam's brother, G. Venkateswaran, under his Sujatha Films banner (later renamed GV Films). It was the company's first film production; until then, it had been involved in distribution and finance. The film was edited by B. Lenin and V. T. Vijayan, with art direction by Thota Tharani. Ratnam cast his Idaya Kovil hero Mohan as the male lead Chandrakumar, and Pagal Nilavu heroine Revathi as the female lead Divya. He initially had "someone like Anant Nag and Supriya Pathak" in mind when he finished writing Mouna Ragam. Between finishing the story and making the film, he decided to include Revathi, whose performance in Mann Vasanai (1983) impressed him. Nadhiya claims she was also considered for the role, but declined due to prior commitments. Ra. Sankaran was cast as Divya's father, Chandramouli, Kanchana as the lawyer, and V. K. Ramasamy as Chandrakumar's boss. Vani plays Divya's mother and Bhaskar her brother; Kalaiselvi and Sonia play her sisters. Prabhu Deva, who became a successful Indian cinematic choreographer, made his acting debut in the film with an appearance in "Panivizhum Iravu" as a boy playing a flute. According to Ratnam, the only difference between Divya and Mouna Ragam was the inclusion of Karthik's character Manohar, which was not part of the earlier screenplay. Divya, the story of a young woman settling into an arranged marriage, did not explore her life before the marriage; it just dealt with an arranged marriage — two strangers suddenly thrown together — and how they adjust. Ratnam realised that the story needed to satisfy a wider audience, and decided to give them something that would make them accept the character without questioning Divya's actions. He originally resisted this, but reconsidered because its suddenness provided a clear rationale for Divya's resistance to the arranged marriage. Karthik said he was a last-minute addition to the cast, and described his role as a cameo. Although Ratnam began work on the script of Mouna Ragam while making Pallavi Anu Pallavi, it did not begin production until after Idaya Kovil's release in 1985. Principal photography began at P. C. Sreeram's house in Alwarpet. The film's introductory credits feature photographs of Revathi from her childhood through her teenage years; her mother gave Thota Tharani the pictures. Although the film was primarily set indoors in Delhi, Ratnam and Sreeram wanted the indoor scenes to look as lively as those shot outdoors. Since the cast was relatively small, Ratnam did not want it to resemble a play and used backlighting for the interior scenes. Tharani found a house in the residential area of Kilpauk in Madras (now Chennai) which admitted a great deal of sunlight, making it similar to houses in Delhi. To reduce production costs, food for the film's crew was cooked at Venkateswaran's home. While filming the introductory scene of Karthik's character, Manohar, Sreeram had to lie on a bed sheet to film. The crew pulled the sheet, with Sreeram and the camera. Sreeram made extensive use of frontal and profile close-ups, set against long shots with out-of-focus foregrounds. The scene where Manohar plays a prank on Divya's father at a coffee shop, which later became known as the "Mr. Chandramouli scene", was shot at an open-air restaurant named Tic Tac in Nungambakkam. Filming was also done at Madras' Presidency College, the Schmidt Memorial on Edward Elliot's Beach, and at the Madras Literary Society. While filming the "Oho Megam Vandhadho" scene which shows Divya dancing in the rain, Revathi tied a handkerchief around her wrist to cover her watch because she felt Divya would actually do that. The crew filmed in Delhi for two days, and the scenes set in Agra were shot in one day. Portions of "Panivizhum Iravu" were shot at the Taj Mahal in Agra, and those from "Mandram Vandha" were shot at the India Gate. The scenes involving Karthik were the last parts to be filmed, being shot in either a week or two. [a] In post-production, Mohan's voice was dubbed by S. N. Surendar. The film's final length was 3,987.50 metres (13,082.3 ft). Mouna Ragam provides insight into the issues faced by married couples, exploring the plight and perception of divorce and how societies need to view the desires of women. Film critic Baradwaj Rangan compared it to Nenjathai Killathe (1980), another story of a woman torn between the man she loves and the man she marries, Antha Ezhu Naatkal (1981) and its Hindi remake, Woh Saat Din (1983). Rakesh Mehar of The News Minute noted that one thing differentiating Mouna Ragam from Antha Ezhu Naatkal and similar films is that it remains focused on Divya. Kumuthan Maderya, writing for PopMatters, described Mouna Ragam a "chick flick", because like other chick flicks, the film allowed romance to blossom between Divya and Chandrakumar, rather than let divorce split them; according to him, "chick flicks center on the romantic worldview of females while gratifying their hopes and dreams usually through a warm and fuzzy denouement". Manohar was part of a group involved in anti-government activities. Rangan drew similarities between his motives and those of characters in the Italian film The Night of the Shooting Stars (1982) and Unaru. According to Rangan, the scene where Divya is looking after Chandrakumar at the hospital reflects her traditional qualities; with her strengths, she is humane and vulnerable. Divya's mischievous nature is shown in a scene where she teaches a Sardar offensive Tamil phrases, which he says to Chandrakumar's boss. Revathi compared herself to Divya, saying that Divya believes in "living life to the fullest" and she was once like that. Sujatha Narayanan, writing for The New Indian Express, described Chandrakumar as a "patient-understanding-and-poised-at-all-times" man and Manohar as a "dashing, brave and epitome-of-the-word-'dude'". She noted that Divya, like the female leads in most of Ratnam's films, is "practical with strong convictions" and the characters "go through their confusions unapologetically". According to Ratnam, the line "Neenga thottaa kambilipoochi oorraa madhri irukku" (When you touch me, it feels as if caterpillars are crawling on me), spoken by Divya to Chandrakumar, expressed how she would feel on her wedding night. According to Rangan, Mouna Ragam's background score was found by critics to suit its scenes and themes. According to Martin Clayton, Trevor Herbert and Richard Middleton's 2003 book, The Cultural Study of Music: A Critical Introduction, "Oho Megam Vandhadho" resembled Broadway and MTV styles of singing and dancing, and the main songs combine American music with Indian vocals by S. Janaki. Sangeetha Devi Dundoo of The Hindu considered that Ratnam used rain in the film to accentuate the "childlike, free-spirited nature" of Divya. The sarangi and nadaswaram (South Asian instruments) are used in the music accompanying Chandrakumar and Divya's wedding. In scenes of the couple sightseeing in Delhi, light synth-based music depicts them as modern tourists in their own country. The restaurant scene with Manohar and Divya includes awkwardly played sitar music, indicating the couple's emotions. Spanish music is used for the fight scene when Manohar attacks the MP's son. Raveena Joseph of The Hindu noted that films in the 1980s and 1990s which featured men stalking women, hoping to get them, were reflective of "the times where romances were covert and such discretion was necessary even in consensual encounters", citing Mouna Ragam as an example. Mouna Ragam was Ratnam's first film to follow the theme of a person moving to a strange place where they do not know the local language. The heroine has a dilemma; because she does not know the language in Delhi she can barely socialise with local people, and she is at loggerheads with the only person with whom she can relate. Rangan believed Karthik to be the first character in a Tamil film to invite a girl for a "cup of coffee", a form of dating. He contrasted it with Oru Thalai Ragam (1980), in which the protagonists barely spoke. Ratnam said that although it was not uncommon to invite a girl for a cup of coffee in the 1980s, it was not reflected in mainstream Tamil cinema of the time. 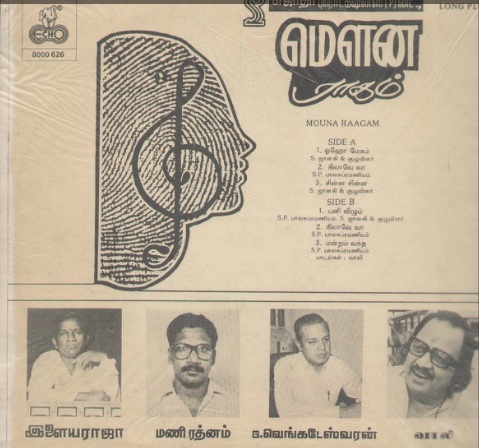 Mouna Ragam's soundtrack album consists of five songs composed by Ilaiyaraaja with lyrics by Vaali, sung by S. Janaki and S. P. Balasubrahmanyam. It was released by the Echo Audio Company. According to The Cultural Study of Music: A Critical Introduction, "Oho Megam Vandhadho" (featuring Divya dancing with several teenage girls) is a reworking of Gene Kelly's "Singin' in the Rain". "Nilaavae Vaa" is the second song on both sides of the soundtrack's original LP record. "Mandram Vandha" is set in the carnatic raga known as Keeravani, with Natabhairavi notes. "Chinna Chinna Vanna Kuyil" is set in Gourimanohari, "Nilaavae Vaa" is set in Dheerasankarabharanam, and "Panivizhum Iravu" is set in Natabhairavi. "Mandram Vandha" was later adapted by Ilaiyaraaja and used twice in the 2007 Hindi film, Cheeni Kum: as the film's title track and the melancholy "Sooni Sooni". The soundtrack received positive critical reviews. Nandini Ramnath wrote for Mint, "Bombay's director, Mani Ratnam, can't make a movie without including a shower from the heavens or a splash in some kind of water body. His best rain song is 'Oho Megham Vanthatho'". Srinivasa Ramanujam of The Hindu also praised the song. S. Saraswathi of Rediff described "Nilaave Vaa" as a "timeless classic that you never tire of". Sruthi Radhakrishnan of The Hindu described "Mandram Vandha" as a "song that drives fans crazy", and "Chinna Chinna Vanna Kuyil" showcased "Janaki's vocals with such astounding effect". About "Panivizhum Iravu", she said: "It's one of those only-80s songs that served as a stand-in for sexual tension, where you'd have two people looking intensely at each other. And it's a brilliant composition too. The percussion gets you hooked and the chorus is almost eerie." For Firstpost, Apoorva Sripathi said: "The film traces a couple's marital discord — the heroine is torn between the man she loved and the man she finally marries — and the soundtrack beautifully mimics it." She called "Mandram Vandha" a "masterpiece, sung soulfully by SP Balasubramaniam." Sify praised the songs, the background music and the re-recording, calling Ilaiyaraaja the "king of re-recording". Mouna Ragam was publicised with a shot of Revathi clinging to a lamp post and singing, which Ratnam confirmed as being inspired by Singin' in the Rain. Before the film's release, a Central Board of Film Certification member wanted it to receive an "A" (adults-only) certificate because the female lead asks for a divorce; after much deliberation, it received a "U" certificate. [b] Mouna Ragam was released on 15 August 1986, India's Independence Day. Despite opening to modest audiences, it picked up and became a box-office success, running for over 175 days in theatres, thereby becoming a silver jubilee film. Ratnam considered Mouna Ragam his first commercial success. The film was later dubbed in Telugu and released with the same title, which was also a success. Mouna Ragam was screened at the 11th International Film Festival of India, the only Tamil entry. It has also been screened at other film festivals, including Mani Ratnam's Love Films at London's National Film Theatre in 2002, a Retrospective of Mani Ratnam's Films at the 2002 Calcutta Film Festival and at the 2002 Locarno Film Festival. An enhanced 5.1 Digital Dolby soundtrack was released in May 2008 by Bayshore Records. The film was critically acclaimed. In a 31 August 1986 review, the Tamil magazine Ananda Vikatan praised Revathi and Mohan's performances and the film's camera work, music and lack of masala, giving Mouna Ragam a score of 43 out of 100. Kaviya Shetty of India Today wrote in 1994, "[Mouna Ragam] found the perfect formula of a strong storyline and great music, presented in a fresh visual style that caught the audience by surprise". According to Karan Bali of Upperstall.com, "Mouna Ragam is looked at as Mani Ratnam's breakthrough film and though somewhat dated in places in terms of both content and style, the film has some of his finest moments". He criticised the film's "smaller comedy tracks", saying that they "don't really add anything to the film"; although he called the film "too simplistic", Bali concluded that it "is well, well worth a watch even today". In 2000, Gautaman Bhaskaran called Mouna Ragam "simple and shorn of pretensions" in The Hindu; a decade later, he praised the film's realistic portrayal of urban Tamil people. Pavithra Srinivasan of Rediff said, "It took a Mani Ratnam to move away from cliched romantic dialogues and capture subtle nuances that add so much richness to the story, introduce proper, three dimensional characters that lived breathed and sorrowed like everyone else". At the 34th National Film Awards, Mouna Ragam received the National Film Award for Best Feature Film in Tamil. Ratnam received the Award for Best Tamil Director at the 36th Filmfare Awards South. Mouna Ragam emerged a milestone of Tamil cinema and Mani Ratnam's breakthrough film. It has been acclaimed for combining box-office success with elements of an art film. The film introduced techniques such as soft-focus shots, flare filters and backlighting, which became popular in Tamil cinema. Ratnam continued using these techniques in his later films, notably Nayakan (1987) and Agni Natchathiram (1988). Mouna Ragam's theme of a person moving to a new place where they do not know the local language was replicated in Ratnam's later films like Nayakan, Roja (1992) and Bombay (1995). It was also Ratnam's first film to make extensive use of staccato dialogue; this became another recurring feature in his later films. The film became a major breakthrough for Karthik despite his role being a cameo, and his "Mr. Chandramouli" dialogue became popular. A feature film, released in 2018 and starring him, was named after this dialogue. Mouna Ragam was remade in Hindi as Kasak in 1992, and in Kannada in 1999 as Chandrodaya. According to a Rediff.com article, "The Most Memorable Mani Movies", Mouna Ragam was "arguably the film that announced Mani Ratnam to the Tamil film industry as a talent to watch out for. An excellent script by Ratnam himself, [cinematography by P. C. Sreeram] and a lilting score by [Ilaiyaraaja] made it a hit with both critics and moviegoers". Deccan Chronicle listed Karthik and Revathi on its "Top 10 Jodis" of Tamil cinema; they "made a fresh pair and were adored by the youth, especially the college students. Their awesome on-screen chemistry in Mouna Ragam was a talking point back then". For the April 2013 centenary of Indian cinema, Forbes India included Revathi's performance in its list, "25 Greatest Acting Performances of Indian Cinema". Mouna Ragam was included in a 2014 CNN-News18 poll of the most popular romantic films of all time. As Gautam Chintamani put it for Swarajya, the film's success "transformed Ratnam into a rock star of sorts. Here was a guy who was saying it like you said it and showing it the way it didn’t seem alien and yet adorning the imagery with a magic that made it extraordinary and lingered long after the lights came up." A scene in Mouna Ragam when Manohar tries to declare his love for Divya through the college intercom in response to her challenge, was parodied in Thamizh Padam (2010), with Shiva and Disha Pandey. Rangan compared Mouna Ragam to the Hindi film Hum Dil De Chuke Sanam (1999); in both films "the disengaged wife was tempted, at several points, to snap free of matrimony, but what held her back, eventually, was the innate decency of the man she married". Vallamai Tharayo (2008) was compared by critics to Mouna Ragam because it also features a woman (Chaya Singh) reluctantly married to a man (R. Parthiepan) whom she does not love; Pavithra Srinivasan of Rediff.com called it "a dull reworking" of Mouna Ragam. Neelima Menon of The New Indian Express called Yathrakarude Sradhakku (2002) a "watered-down version" of Mouna Ragam. Actress Sri Divya called Revathi's character her "all-time favorite role", saying that she played a similar role in Mallela Theeram Lo Sirimalle Puvvu (2013). Actor Karthi said that his character in Naan Mahaan Alla (2010) was similar to Karthik's "moody yet jovial" character in Mouna Ragam. Writing for Mint, Nandini Ramnath compared Tanu Weds Manu (2011) to Mouna Ragam because of the similar relationship between their male and female leads. The Hindu's S. Shiva Kumar wrote in his review of Rab Ne Bana Di Jodi (2008), "A carefree and cheerful girl whose boyfriend dies on the day of the wedding is forced to marry a staid suitor by the father who suffers a heart attack. The similarity [with Mouna Ragam] ends there." The Kannada film Milana (2007), which had the theme of marital problems, too was compared with Mouna Ragam. Raja Rani (2013) was compared to Mouna Ragam, sharing the theme of marital problems; in the former film, both the male (Arya) and female (Nayanthara) leads have past lovers. The restaurant scene with Manohar and Divya was recreated by Prasanna and Lekha Washington's characters in Kalyana Samayal Saadham (2013). Vaibhav Reddy compared his character in Kappal (2014) to Manohar in Mouna Ragam because of their shared effervescence. In one scene, which Reddy compared to the "Mr. Chandramouli" scene, his character pesters the heroine to fall in love with him. M. Suganth of The Times of India called the Malayalam film Bangalore Days (2014) a "sort-of Mouna Ragam with the roles reversed", since it was about a man who is unable to forget his past love and accept his wife. The "Mr. Chandramouli" scene was re-enacted in Idhu Enna Maayam (2015). Malini Mannath of The New Indian Express compared Maalai Naerathu Mayakkam (2016), written by Selvaraghavan, to Mouna Ragam because its female lead is unhappily married to the male lead; Baradwaj Rangan called the film "Mouna Raagam, Selvaraghavan style". Director B. V. Nandini Reddy said that the story of a bride unhappy with her husband in Mouna Ragam inspired her to make Kalyana Vaibhogame (2016), where neither the bride nor the bridegroom is interested in marriage. ^ In a 2010 interview with The Times of India, Karthik said his scenes were shot in a week, and contradicted this in a later interview with The Hindu, saying they were shot in fourteen days. ^ In CFBC terminology, "U" means "unrestricted public exhibition", similar to MPAA's G and PG ratings and BBFC's U and PG ratings. ^ Rangan 2012, p. 289; Rajadhyaksha & Willemen 1998, p. 476. ^ a b c d Narayanan, Sujatha (27 August 2016). "One-of-a-kind forever love on celluloid". The New Indian Express. Archived from the original on 28 August 2016. Retrieved 28 August 2016. ^ a b c d e f g h Rangan 2012, p. 289. ^ a b Shivpprasadh, S. (14 June 2012). "Father figure". The Hindu. Archived from the original on 29 November 2014. Retrieved 22 February 2016. ^ a b Nadadhur, Srivathsan (20 August 2015). "Yesteryear actors: Old and still gold". The Hindu. Archived from the original on 22 February 2016. Retrieved 22 February 2016. ^ a b c Rangan 2012, p. 22. ^ Rangan 2012, p. 38. ^ a b Rangan 2012, p. 29. ^ a b c Rangan 2012, p. 42. ^ a b c d Rangan 2012, p. 31. ^ a b c d e f g "30 years of 'Mouna Ragam': Love, divorce and marriage like never before!". Sify. 25 August 2016. Archived from the original on 1 September 2016. Retrieved 1 September 2016. ^ Rangan 2012, p. 24. ^ Rangan 2012, p. 10. ^ Sangita (30 January 2008). "Nadia spelt fun". The Hindu. Archived from the original on 15 November 2014. Retrieved 15 November 2014. ^ Raghavan, Nikhil (10 December 2011). "Born to Dance". The Hindu. Archived from the original on 1 March 2016. Retrieved 1 March 2016. ^ "Happy Birthday Prabhu Deva: The Dancing Superstar's Secret to a Lean Body". NDTV. 3 April 2017. Archived from the original on 4 February 2019. Retrieved 4 February 2019. ^ a b c d Lakshmi, V. (5 April 2010). "Powerful comeback for Navarasa". The Times of India. Archived from the original on 25 October 2014. Retrieved 25 October 2014. ^ a b c d Ramanujam, Srinivasa (5 July 2018). "Wouldn't advise Gautam to do adult comedies like 'Iruttu Araiyil Murattu Kuthu', says dad Karthik". The Hindu. Archived from the original on 18 July 2018. Retrieved 18 July 2018. ^ a b Prakash, R. S. (13 June 2010). "One more time". Bangalore Mirror. Archived from the original on 8 April 2018. Retrieved 5 November 2014. ^ a b c d e f g Srinivasan, Sudhir (3 September 2016). "'Divya was a lot like me'". The Hindu. Archived from the original on 3 September 2016. Retrieved 3 September 2016. ^ "Director PC Sreeram's daughter falls to death". The New Indian Express. 8 November 2010. Archived from the original on 4 September 2016. Retrieved 4 September 2016. ^ Kamath, Sudhish (12 October 2007). "Why I like... Mouna Ragam". The Hindu. Archived from the original on 16 October 2014. Retrieved 16 October 2014. ^ a b c Rangan 2012, p. 36. ^ "How Mani Ratnam cut production cost?". The Times of India. 20 April 2014. Archived from the original on 20 July 2014. Retrieved 15 October 2014. ^ Rangan 2012, p. 40. ^ Rajadhyaksha & Willemen 1998, p. 476. ^ Iyer, Anuja (9 July 2012). "How To Name It". Behindwoods. Archived from the original on 6 August 2014. Retrieved 25 October 2014. ^ Ravi, Nandita (4 June 2015). "Colleges turn shooting spots in Chennai". The Times of India. Archived from the original on 25 August 2015. Retrieved 25 August 2015. ^ Padmanabhan, Geeta (23 February 2016). "Chennai on reel". The Hindu. Archived from the original on 28 February 2016. Retrieved 28 February 2016. ^ Kannadasan, Akhila (26 August 2016). "A place called Chennai". The Hindu. Archived from the original on 26 August 2016. Retrieved 28 August 2016. ^ Rangan 2012, p. 170. ^ Ramanan, V. V. (14 March 2008). "Cine quiz". The Hindu. Archived from the original on 16 October 2014. Retrieved 16 October 2014. ^ a b "'Mouna Ragam' (Celluloid)". Central Board of Film Certification. 14 August 1986. Retrieved 7 June 2016. ^ Rangan 2012, p. 32. ^ a b Rangan, Baradwaj (13 December 2008). "Review: Rab Ne Bana Di Jodi". Baradwaj Rangan. Archived from the original on 5 August 2010. Retrieved 30 April 2016. ^ Mehar, Rakesh (31 August 2016). "30 years since 'Mouna Ragam': the Mani Ratnam we miss". The News Minute. Archived from the original on 6 September 2016. Retrieved 6 September 2016. ^ Maderya, Kumuthan (26 October 2016). "Is Indian Cinema's First Chick Flick, 'Mouna Raagam', a Hindu Nationalist Fantasy?". PopMatters. Archived from the original on 8 November 2016. Retrieved 8 November 2016. ^ Rangan 2012, p. 33. ^ Rangan 2012, pp. 38–40. ^ Krishnan, Chandrika R. (26 August 2007). "Need to outgrow petty differences". The Hindu. Archived from the original on 15 November 2014. Retrieved 15 November 2014. ^ Narayanan, Sujatha (5 September 2016). "Leading ladies in their element!". The New Indian Express. Archived from the original on 5 September 2016. Retrieved 5 September 2016. ^ Clayton, Herbert & Middleton 2003, pp. 292–294; Rangan 2012, p. 40. ^ a b Clayton, Herbert & Middleton 2003, pp. 292–294. ^ Dundoo, Sangeetha Devi (26 July 2017). "Many moods of monsoon seen on the silver screen". The Hindu. Archived from the original on 2 August 2017. Retrieved 2 August 2017. ^ Joseph, Raveena (10 October 2017). "Stalking in society: is cinema to blame or just a scapegoat?". The Hindu. Archived from the original on 11 October 2017. Retrieved 11 October 2017. ^ Shankar 2012, pp. 113–114; Rangan 2012, p. 42. ^ Rangan 2012, pp. 33–34. ^ a b c Ilaiyaraaja (1986). "Mouna Raagam". Echo Audio Company. Archived from the original on 6 July 2015. Retrieved 1 January 2015. ^ "Mouna Raagam (1986)". Raaga.com. Archived from the original on 16 October 2014. Retrieved 10 March 2012. ^ Clayton, Herbert & Middleton 2003, p. 293. ^ a b "The Firstpost Playlist: The Beatles' heartbreak, Ilaiyaraaja's classical strains and Chitra Singh's ghazal". Firstpost. 4 June 2016. Archived from the original on 7 June 2016. Retrieved 7 June 2016. ^ Lalitha, M. (7 January 2012). "Natabhairavi's Jewish connection". The Times of India. Archived from the original on 9 May 2016. Retrieved 9 May 2016. ^ Sundararaman 2007, p. 126. ^ Sundararaman 2007, p. 148. ^ Sundararaman 2007, p. 152. ^ "Old is the new tune for Bollywood". The Times of India. 25 September 2007. Archived from the original on 16 October 2014. Retrieved 16 October 2014. ^ Rangan, Baradwaj (15 May 2007). "Music Review: Cheeni Kum". Baradwaj Rangan. Archived from the original on 26 October 2014. Retrieved 19 October 2014. ^ Ramnath, Nandini (8 June 2013). "Sweat equity". Mint. Archived from the original on 14 November 2014. Retrieved 14 November 2014. ^ Ramanujam, Srinivasa (17 May 2016). "It's time to listen to some rain songs". The Hindu. Archived from the original on 18 May 2016. Retrieved 18 May 2016. ^ "The Top 10 songs of S P Balasubrahmanyam". Rediff.com. 9 June 2014. Archived from the original on 16 October 2014. Retrieved 16 October 2014. ^ Radhakrishnan, Sruthi (2 June 2016). "The eclipsed gems from Raja and Ratnam". The Hindu. Archived from the original on 7 June 2016. Retrieved 7 June 2016. ^ Shivakumar, S. (26 October 2012). "Balance that has spelt success". The Hindu. Archived from the original on 28 February 2016. Retrieved 28 February 2016. ^ Rangan 2012, p. 147. ^ "Film Certification". Central Board of Film Certification. Archived from the original on 7 October 2014. Retrieved 22 October 2014. ^ Kumar, N. Vinoth (2 September 2016). "மௌனராகம் 30: நினைவில் நகரும் கம்பளிப்பூச்சி!" [Mouna Ragam 30: The caterpillar that moves in my thoughts!]. The Hindu Tamil. Archived from the original on 6 September 2016. Retrieved 6 September 2016. ^ Rangan, Baradwaj (25 August 2016). "LIVE: 30 years of Mouna Raagam with Baradwaj Rangan". The Hindu. Archived from the original on 19 September 2016. Retrieved 18 September 2016. ^ Kumar 1995, p. 120. ^ Balasubramanian, Roshne (5 July 2018). "The reels of purohitham". The New Indian Express. Archived from the original on 18 July 2018. Retrieved 18 July 2018. ^ Selvaraj, N. (20 March 2017). "வெள்ளி விழா கண்ட தமிழ் திரைப்படங்கள்" [Tamil films that completed silver jubilees]. Thinnai (in Tamil). Archived from the original on 29 March 2017. Retrieved 18 February 2018. ^ Ratnam, Mani (director) (1987). Mouna Ragam (motion picture) (in Telugu). India: Sujatha Productions. Archived from the original on 10 May 2016. ^ Hemanth (9 November 2010). "Evolution of Dubbed Films in Andhra Pradesh". South Scope. Archived from the original on 21 October 2013. Retrieved 18 May 2017. ^ "Indian Cinema 1986" (PDF). International Film Festival of India. 1987. pp. 132–134. Archived (PDF) from the original on 5 February 2019. Retrieved 5 February 2019. ^ Jain, Madhu (15 January 1987). "Good, bad and ugly – 11th IFFI: Picture of Indian cinema bleak, harvest of films better". India Today. Archived from the original on 16 October 2014. Retrieved 16 October 2014. ^ Ministry of Information and Broadcasting 2002, p. 46. ^ "New in Stores: Masters Special". The Times of India. 30 May 2008. Archived from the original on 9 May 2016. Retrieved 9 May 2016. ^ India Book of the Year. Encyclopædia Britannica. 2003. p. 113. ISBN 81-8131-000-4. ^ Shetty, Kaviya (15 February 1994). "A shooting success". India Today. Archived from the original on 3 April 2018. Retrieved 3 April 2018. ^ Bali, Karan. "Mouna Ragam". Upperstall.com. Archived from the original on 9 February 2014. Retrieved 15 October 2014. ^ Bhaskaran, Gautaman (21 April 2000). "Weaving emotions into celluloid". The Hindu. Archived from the original on 16 October 2014. Retrieved 16 October 2014. ^ Bhaskaran, Gautaman (7 September 2010). "Venice honours Mani Ratnam". Hindustan Times. Archived from the original on 15 October 2014. Retrieved 15 October 2014. ^ a b Srinivasan, Pavithra (9 June 2010). "Looking at Mani Ratnam's landmark movies". Rediff.com. Archived from the original on 6 October 2014. Retrieved 16 October 2014. ^ Collections. Update Video Publication. 1991. Archived from the original on 9 April 2016. ^ Joshi & Dudrah 2016, p. 86. ^ The Hindu 2000, p. 288. ^ Reddy, T. Krithika (28 May 2010). "Second coming". The Hindu. Archived from the original on 18 October 2014. Retrieved 18 October 2014. ^ "Karthik-Gautham Karthik' film titled 'Mr. Chandramouli'". Sify. 10 October 2017. Archived from the original on 10 October 2017. Retrieved 10 October 2017. ^ "Married to Mr Right". Rediff.com. 28 March 2007. Archived from the original on 16 February 2016. Retrieved 28 February 2016. ^ Srinivasa, Srikanth (7 February 1999). "Chandrodaya (Kannada)". Deccan Herald. Archived from the original on 6 May 1999. Retrieved 19 October 2018. ^ "The most memorable Mani movies". Rediff.com. 12 January 2007. Archived from the original on 16 October 2014. Retrieved 16 October 2014. ^ Subramanian, Anupama (14 February 2013). "Top 10 Jodis". Deccan Chronicle. Archived from the original on 16 October 2014. Retrieved 16 October 2014. ^ Prasad, Shishir; Ramnath, N. S.; Mitter, Sohini (27 April 2013). "25 Greatest Acting Performances of Indian Cinema". Forbes India. Archived from the original on 28 October 2014. Retrieved 28 October 2014. ^ "Valentine's Day Poll: 'DDLJ' is the most popular romantic film of all time". CNN-IBN. 15 February 2014. Archived from the original on 12 November 2014. Retrieved 12 November 2014. ^ Chintamani, Gautam (17 June 2016). "Is Mani Ratnam A Victim Of His Own Image?". Swarajya. Archived from the original on 2 September 2016. Retrieved 2 September 2016. ^ Ratnam, Mani (1986). Mouna Ragam (motion picture) (in Tamil). India: Sujatha Productions. Event occurs at 56:04. ^ Amudhan, C. S. (2010). Thamizh Padam (motion picture). India: Cloud Nine Movies. Event occurs at 40:40. ^ "Tamil Padam". Sify. 29 January 2010. Archived from the original on 16 October 2014. Retrieved 16 October 2014. ^ Rangarajan, Malathi (27 June 2008). "Well begun, just half done — Vallamai Thaaraayo". The Hindu. Archived from the original on 6 July 2015. Retrieved 5 July 2015. ^ "Vallamai Tharayo". Sify. 28 June 2008. Archived from the original on 6 July 2015. Retrieved 5 July 2015. ^ Srinivasan, Pavithra (24 May 2010). "Kola Kolaya Mundhirika will have you in spilts [sic]". Rediff.com. Archived from the original on 15 January 2012. Retrieved 16 February 2016. ^ Menon, Neelima (6 November 2011). "The director with the golden touch". The New Indian Express. Archived from the original on 28 February 2016. Retrieved 28 February 2016. ^ Pandian, Avinash. "I am not a glam doll, will never be one". Behindwoods. Archived from the original on 8 January 2016. Retrieved 29 February 2016. ^ "Karthi's Naan Mahaan Alla in July". Sify. 25 June 2010. Archived from the original on 3 March 2016. Retrieved 3 March 2016. ^ Ramnath, Nandini (26 June 2013). "Woman is the ruin of man". Mint. Archived from the original on 12 March 2016. Retrieved 11 March 2016. ^ Kumar, S. Shiva (19 December 2008). "Not even child's play". The Hindu. Archived from the original on 14 October 2016. Retrieved 14 October 2016. ^ "'Raja Rani' remake of 'Milana'". The New Indian Express. 3 October 2013. Archived from the original on 21 August 2018. Retrieved 4 November 2018. ^ "Parvathy dubs for Poo". Sify. 4 August 2008. Archived from the original on 31 October 2018. Retrieved 31 October 2018. ^ "Raja Rani". Sify. 27 September 2013. Archived from the original on 31 October 2018. Retrieved 4 November 2018. ^ Kamath, Sudhish (28 September 2013). "Raja Rani: Boy, Girl, Her Ex and His". The Hindu. Archived from the original on 16 October 2014. Retrieved 16 October 2014. ^ "Review: 'Raja Rani'". Deccan Chronicle. 4 October 2013. Archived from the original on 16 October 2014. Retrieved 16 October 2014. ^ "Raja Rani". Sify. 27 September 2013. Archived from the original on 16 October 2014. Retrieved 16 October 2014. ^ Rao, Subha J. (28 December 2013). "Well-served". The Hindu. Archived from the original on 29 December 2013. Retrieved 16 October 2014. ^ Srinivasan, Sudhir (29 November 2014). "'It's now my turn to prove myself'". The Hindu. Archived from the original on 11 December 2014. Retrieved 11 December 2014. ^ Suganth, M. (6 February 2016). "Bangalore Naatkal Movie Review". The Times of India. Archived from the original on 22 February 2016. Retrieved 22 February 2016. ^ Rangan, Baradwaj (3 August 2015). ""Idhu Enna Maayam"... Fascinating premise, but the film's a mess". Baradwaj Rangan. Archived from the original on 8 September 2016. Retrieved 2 September 2016. ^ Mannath, Malini (11 January 2016). "Script Lacks the Selvaraghavan Trademark". The New Indian Express. Archived from the original on 25 January 2016. Retrieved 29 February 2016. ^ Rangan, Baradwaj (13 January 2016). ""Maalai Nerathu Mayakkam"... An unbelievable story about an unsuited couple". Baradwaj Rangan. Archived from the original on 29 February 2016. Retrieved 29 February 2016. ^ Dundoo, Sangeetha Devi (11 January 2016). "Director Nandini Reddy on Kalyana Vaibhogame, marriages, then and now". The Hindu. Archived from the original on 3 March 2016. Retrieved 3 March 2016. Clayton, Martin; Herbert, Trevor; Middleton, Richard (2003). The Cultural Study of Music: A Critical Introduction. Psychology Press. ISBN 0-415-93845-7. The Hindu (2000). Students' Britannica India, Volumes 1–5. Popular Prakashan. ISBN 0-85229-760-2. Joshi, Priya; Dudrah, Rajinder (2016). The 1970s and Its Legacies in India's Cinemas. Routledge. ISBN 978-0-415-83658-6. Kumar, K. Naresh (1995). Indian cinema: ebbs and tides. Har-Anand Publications. Ministry of Information and Broadcasting (2002). Report – Government of India, Ministry of Information and Broadcasting. Shankar, Subramanian (2 July 2012). Flesh and Fish Blood: Postcolonialism, Translation, and the Vernacular. University of California Press. ISBN 0-520-95234-0. Sundararaman (2007) . Raga Chintamani: A Guide to Carnatic Ragas Through Tamil Film Music (2nd ed.). Pichhamal Chintamani.